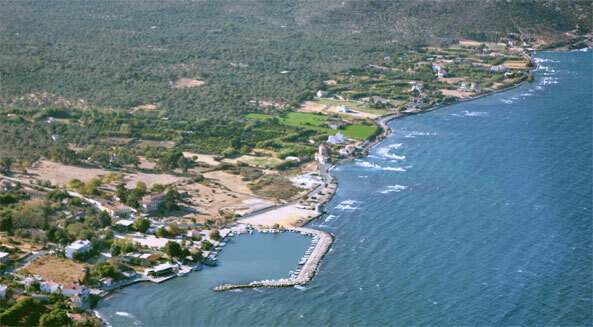 Between these two villages, which are the physical boundary of the Municipality of Loutropoli Thermis, we see the villages and the fish-ports that belong to this Municipality. Municipality named after its natural hot springs. The history of the name' s origin dates back to the Hellenistic and Roman Era, when the Greeks and the Romans had built a group of public bath-rooms taking advantage of the area' s natural gift and its healing abilities and turning the town into a summer resort. We should not forget to mention that at the same area, the inhabitants used to worship the goddess Artemis, the natural hot springs' protector. Going through the 6th millennium, the place has not lost yet its charm and the visitor has the possibility to admire the wonderful natural surroundings gifted with numerous qualities. The endless olive grooves, the oleanders and the osiers, all over the ravines, compose the greenest landscape on the island. The medieval rural villages, hidden among the hills, still remain intact from the modern tourism' s effects. The past of this place is all over the place obvious; through the marble bas-relief on the traditional houses' walls, through the ancient columns on the houses' thresholds, through the ancient pots' fragments shattered all over the area' s coasts, through the miraculous monasteries, as well as the old churches and chapels. These forests were of great importance for the inhabitants, as they needed material for their constructions, their boats, cooking and heating, but mostly for their pottery furnaces. So, the inhabitants had started to denude the plain of the trees, having this way material and free space for their cultivations and the construction of their villages. Since then, the sea level has risen three metres "rinsing", this way, half of the hill, removing the prehistoric houses' stones from the hill and accumulating them on the seashore. After the excavation, this archaeological site has been covered again with soil, for reasons of protection. Anyone who observes, at the archaeological museum, the exhibition of this rare prehistoric collection of ceramics coming from the area of Thermi, can not help asking himself about the slow rhythm with which the art of pottery has been developed until nowadays, 5000 years later. We should mention that during the Ottoman Occupation, at the beginning of the 19th century, there have been constructed the modern bath-rooms with separated baths made of marble. Restored in 1997 and work until today. Most of the fountains that we find in the villages and on the old streets date back to the Ottoman Era. At the end of the 19th century, a Turkish businessman finances the construction of the hotel Sarlitza (meaning Yellow Spring). During the decade of 70s it stopped working due to bureaucratic reasons, not being able to deal with the new conception that regarded vacations. But the "Sarlitza Pallas" had been for many decades the most "in" hotel on the island and had managed to give back to Thermi some of the lost splendour of the Roman Era. Although Lesbos had been liberated since 1912 by the Greek fleet, the Greeks went on living peacefully together with the Turkish people on the island, until 1922. Another road leads to the chapel of St Charalampos on the mountain Tavros, where the ancient habit of the bull' s sacrifice takes place, followed by horses' races and prices. In the Tenegia ravine there are the unique caves of St Efthymios and of St Ioannis. 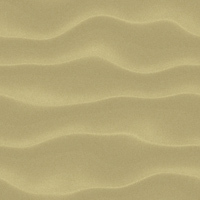 It is a majestic place, where the hermits used to live, during the 14th century. There is also a third cave, the cave of St Philippos. We can easily approach only the first one. If we go further, at the north, we will find the beach of Agios Georgios, while, if we move on further, we will find the beautiful beach of Petalidi, where we can also enjoy our meal at the tavern by the sea. From Petalidi, there is a path that leads to the small monastery of St Akindini, built during the 17th century (there are no monks any more). 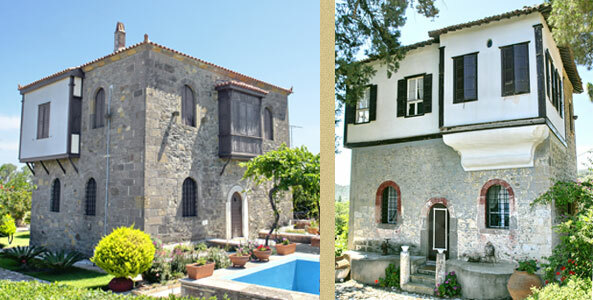 At the village Nees Kydonies, the mosque gave hospitality to the Christian religion, when the Church of St Georgios the Chiopoliti settled down in it. From here the roads lead to the mountain of Tavros and to the village Agia Paraskevi, through the wonderful pine-trees' forest. At the seaside of the village, the landscape is completed by the picturesque small port, the mole of an ancient port. Small taverns give the visitor the possibility to enjoy a tasteful meal together with the wonderful view. On the small island, a little bit further on the north we can see the submarine ancient ruins of a small town. 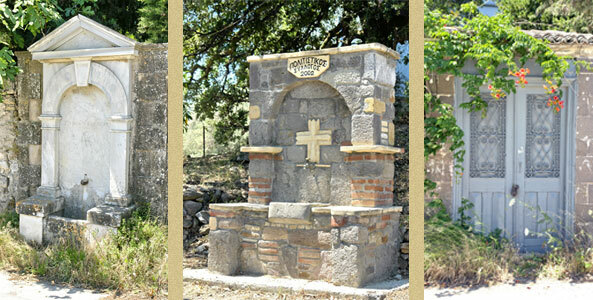 The village is the natural boundary of the Municipality Loutropoli Thermis on the north. The whole area is covered with olive trees, the basic product from which the Municipality earns its income. We can also understand that, by the big number of olive presses (8) that work at the Municipality' s villages.